"Yes, tremble in fear of the great Swimming Apocalypse!" Ven looked up, his expression confused and bewildered. Which was hard to do without eyebrows. He recognized the figure and flapping of a magikarp. There had been plenty in his home cave and the ones that where just cowards waiting to evolve where probably his preferred form of this pokemon. The type that actually tried to fight where annoying, and would just splash up and down trying to attack the zubats with their useless attacks while the bats where on the ceiling. Zubat had yet to see either of them evolve into a gyrados so neither method worked very well. The zubat looked around he seemed amused by this more then afraid. "You guys hear that?" He asked. "Yes, tremble in fear of the great Swimming Apocalypse!" Mist snarled. "Are. You. Kidding. Me." she hissed, looking up. "You guys hear that?" Mist frowns. "How can you not hear that ruckus?" she asks quietly, as the Magikarp landed on her tail. She wiggled a bit at the Splash attack. She turned to face the Magikarp, baring her fangs. "What do you want, runt." she hissed, glaring at him. Seion stared at the Magikarp, a grin pressed on his face as he tried not to laugh at the fish for trying to act tough, when it couldn't even do anything. He turned around he looked off to where the battle frontier was. He looked back at his new companions. "Just leave the fish, its to weak to do anything let alone try and hurt us." Seion didn't care if the others didn't like his bossiness, he just wanted to get a move on before the sun was completely gone from the sky. Melanie nods her head at Staccato's statement, "Of course we should go." Mist pointed out that some of the pokemon could be stronger. The Vulpix chuckled, "Though the infected could be stronger, there's probably lots of f-" Melanie was cut off by a stranger voice, finishing off her sentence, "FOOD!" The voice reveals himself as, "Swimming Apocalypse", nibbling on everyone. The moment the Magikarp nibbled on Melanie, the Vulpix just made an awkward smile, "Hello..."
The Vulpix looked up, Staccato, Mist, and Ven pointed out they had also heard something. The Arbok then hissed at the Magikarp, "What do you want, runt." Melanie sighed, "Mist go easy, it's just a Magikarp, won't do much damage to us..."
While attacking, SA overheard their conversation about a new area with stonger infected, and stopped. "Stronger foes! Sounds like you all need my help." He also heard something about a strange noise. "Come on lets go find whatever that noise is, and let me show you what I can really do." After saying such powerful words, they couldn't follow up with his embarasing looks and actions. This was getting way out of hand. This... Swimming Apocalypse decided to spring out of nowhere, bruised and a little scary with its unblinking eyes. I'd normally eat your kind but... The Chatot tweeted a short note, his confusion of the situation settling down. We need to get away from this place as soon as possible. While the others speculated at the Magikarp's ridiculousness with varying opinions, Staccato scooted closer to the thing. When it started babbling on about 'what he can really do', the Music Note Pokemon glanced back at his teammates, before turning to SA. "Come here, Magikarp, I'm not gonna eat ya," the Chatot muttered, attempting to hold onto to the slippery scales of the fish. "Look, Swimming whatever-it-was, we're trying to get away from the danger at this lighthouse, not try to beat it up. We're planning on going to a place that might be a little tougher, but it most likely has prizes we can reap." Finally latching onto the tail of the fish, Staccato lifted it up into the air with a few flaps of his wing. "I guess we have no choice but to bring you along..."
Ven chuckled happily at the thing. It was an amusing prospect which he really wished he could see. When Mist turned around to snarl at the thing Ven playfully swatted at it. "I zha'll battle the apocalypze! 'or I am Ven thee Nightbat!" He laughed and rolled off of Mist. When the magikarp attacked him he simply used Wing Attack on it, not really seeing why he shouldn't. But something did result from this, he felt a strange power surging through him and he jumped off of Mist. His senses where enveloped in the power and he felt himself grow and get bigger and something else happened he felt something forming on his head. He cringed in pain as the new appendages where formed. Ven used his wings to cover his painfilled head, being aware of some sort of light. Wait light? Since when had that ever been relevant? He could hear more now, his senses had been fixed. Ven didn't feel the scratch on his head anymore. Did I just evolve? Shouldn't I have eyes now? he thought. He turned his head left and right all was dark. The golbat blinked and opened his eyes, the first thing he saw was a large pretty 'purple' pokemon with a scarred eye. "Just leave the fish, its to weak to do anything let alone try and hurt us." "Mist go easy, it's just a Magikarp, won't do much damage to us..." The Arbok scowled. She was just finished killing an infected Ditto, now there was a undead Magikarp trying to kill them. This was really not her day. "Look, Swimming whatever-it-was, we're trying to get away from the danger at this lighthouse, not try to beat it up. We're planning on going to a place that might be a little tougher, but it most likely has prizes we can reap. I guess we have no choice but to bring you along..." Mist was about to retort when her mind began to yell at her. 'Think about the advantage you overgrown snake! If we can befriend a undead Magikarp, then it may be on out side when it evolves! An undead Gyarados on our team, just think about it! Don't throw this chance away!' Mist frowned, but kept quiet. Then Ven began to 'fight' with it, and she gave a hearty laugh. It looked funny, nothing was really happening. All the sudden, Ven began to glow. "Vhat the...?" Mist's eyes widened. 'Is Ven.... Evolving?' she thought, watching. He was, and the evolution finished and he became a Golbat. He had eyes now, and he carefully opened them. She smiled happily, glad that her friend had evolved. "Meest?" She nodded. "Yep. Congratulations on evolving!" she grinned. Mist replied with a scowl and frown, but said nothing nonetheless. Melanie glanced at the Magikarp, it seemed quite useless, true, but something seemed off... Besides the fact it was infected of course. A glow came from Ven, "Ven?!" Melanie seemed frightened, what was happening? Is he 'evolving' like what Mist said? How was that possible? They needed to reach the Evolution pond to do so back in Treasure town. Is this world different? The Glowing faded a bit, Mist let out a gleeful grin, "Yep. Congratulations on evolving!" The Vulpix blinked, using her tail to poke Mist, "How do you... Evolve?" She could never understand the concepts, but she must know. SA heard the bird talking to him about going to a new area with rewards and stronger opponents to face, and bringing him along with them. He turned flopping up and down happily at the news. "Tougher enemies. Prizes! Sounds like a dream! I never thought I'd be friends with... such... delicious... meat." He shook his head, snapping out of his fantasy and back to talking with them. "Well come on. The sooner we go the better." But before anyone could respond to that, SA was struck by a powerful force of wind onto the wall by the bat creature. It then started to glow, changing its shape to something more fearful. "Ha! So strong even interacting with me makes you stronger." One bright flash later, an awkward Magikarp the next, and their small group was staring at a Golbat, looking around with confused eyes. Congratulations were immediately given, and Staccato joined in the praises. "That's awesome, Ven! How's it like being able to see?" Clucking his tongue in pleasure, the Chatot knew he would never learn the joy of evolution, but for the moment, this one event was enough to brighten his spirits. If the epidemic were to stop, more happy times like this could happen. "Ha! So strong even interacting with me makes you stronger." Staccato snorted mid-flight as he carried the Magikarp higher into the air, possibly a feet between the orange fish's mouth to the floor. This little guy has guts... maybe we can eat him? The Music Note Pokemon shook his head with that stupid thought- everyone knew that a Magikarp's scales were unimaginably thick. Flying to the door, he turned to the others. "Let's get a move on then, shall we?" "How do you... Evolve?" Mist cocked her head to the side. 'She doesn't know how to evolve?' she wondered, curious. "Um, w-well... When you train a lot, and you get s-stronger, sometimes you evolve." She explained. "Let's get a move on then, shall we?" The Arbok perked up and nodded, following the chatot. The Seviper followed the Chatot without much word, slithering along as if there wasn't a care in the world, like the infection was a simple cold that would soon pass. The city was bleak and lifeless, just like it was when he first got here before he met the pokemon in the lighthouse. The Zubat managed to evolve into a Golbat, but he didn't pay any mind to it, as fascinating as it was. Like some pokemon, he would never feel the effects of evolution, his species was one that could not, like the Zangoose and Absol evolution was not one he had to worry about. He didn't care much for change, be preferred things stay the same, though that never stopped him from thinking of what he mite become if he ever could evolve. He looked back at the others before back to in front of him. He started to think that maybe the Chatot was the leader of the group since it had almost all the answers, or maybe this group was without one. "So may I ask who is in charge of your little group?" He asked as he looked back at the Arbok and Golbat. Hoping to know if this was a group that had one, or without. Ether worked for him, if the group had a leader he would probably still do what he pleased. The Vulpix blinked at the Arbok's reply, she frowned, then gazed at her feet, 'I thought they need to go somewhere... Or have a certain item to evolve...' Melanie let out a heavy sigh as she let the thoughts get branded into her memory. She trudged towards the door where Staccato and Mist awaited, unable to wait to go to the Battle Frontier perhaps, but nonetheless, she'll follow along, she really doesn't know this place anyways. "So may I ask who is in charge of your little group?" Seion perked up. The Vulpix blinked in surprise, realizing there was no leader has been appointed. She remembered being a leader of her own team, but she considered herself retired the moment she ran from Treasure Town. The inspected each of the Pokemon that huddled in the lighthouse, her eye especially tugging towards the Chatot, "How about Stacatto? He's the one that suggested the idea in the first place~" Melanie chimed in delight. Someone should kill the Magikarp, as Machunine is now banned. "So may I ask who is in charge of your little group?" ... What? Staccato gently laid Swimming Apocalypse (oh, for the love of Arceus, what were they supposed to do with this little tyke?!) on the ground, eying it carefully. Don't jump off too far. He warned the Magikarp silently, turning back to the conversation. Everyone glanced at one another with uncertainty, until Mel piped up that of all the Pokemon here, it was he whom was the leader. "Oh no, no, no! Really, I barely got out of the fight we had in that lighthouse," the Chatot winced slightly, the hideous three-talon scar across his back twinging with hurt at being mentioned. "I don't think I'd be the real leader of our team, in any case." Clucking his tongue in thought, he looked at all the members; there was Ven, the Golbat whom was still adjusting to sight. 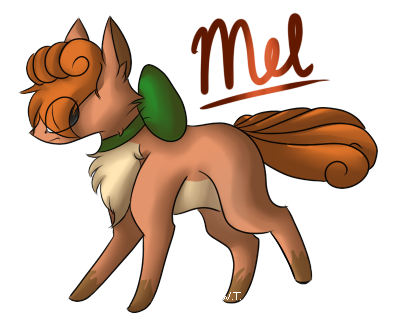 There was Mel, the innocent little Vulpix that she was... Faux... The Chatot was starting to believe he had grown a soft spot for Vulpixes. Glancing towards the two snakes, Seion and Mist, he thought they'd be rightful candidates as leaders. Mist was definitely strong, if only her reluctance didn't stop her. Seion himself seemed very mysterious in his past and his commitment, but Staccato was pretty sure he could hold his own easily in battle. The Music Note Pokemon landed softly, preening his feathers as he looked out into the city. It was only a few hours after he'd arrived here in Johto and after his trainer was brutally murdered that he landed in the lighthouse and met Ven. "I barely know the actual surroundings of Johto itself." Staccato glanced at their misfit group, different Pokemon with different backgrounds. They were forced together in the worst of circumstances, yet they stood as a band, preparing for even the worst to come. The Chatot smiled softly. "Let's just work as equals. We'll talk things through before making a final decision." The bird Pokemon tweeted a quick note, scraping his talon along the hard cement ground. Equals. We work as equals. Ven was drinking in everything every color, every shade, the fading light, every sight he could. As his friends started speaking he looked towards them with wide eyes matching there voices with their bodies. Mist the pretty 'purple' creature with a scratch over her eye, Staccato was 'blue' and 'black' with feathers and some weird symbol on his head, Seion black too and a snake like Mist, Ven tilted his head, Melanie was red with alot of fluffy tails at her back and a 'green' thing around her neck. 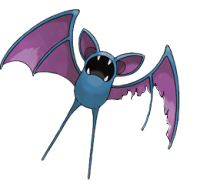 The newly evolved golbat wondered what he looked like and wether or not he could fly again. He looked at his broken wing, it didn't seem too hopeful. He looked around again amazed at all the little things in the world he had missed, every blade of grass fascinated him, the crumbling buildings which probably made the others depressed made him amazed, with his sonar he'd never been able to see these little details. Needless to say Ven wasn't focused on what was going on in the conversation at all. More amazed with the sunset and the pretty clouds. When he finally did start listening all he heard was that magikarp. Ven looked towards it as it flapped around shouting death threats, he enjoyed the pretty scales that changed colors in the sunlight but he also heard how loud it's shouts where. And he felt something else, infected, with their scents and groaning how could he not? Just because they where undead didn't mean that they couldn't hear though and this little fish was causing too much ruckus. Ven scowled and walked over to the magikarp, stumbling around it was his first time ever using legs. "Zhut up! Other eenfected can 'ere you!" he snapped at it. "Hah! I shall fight every one of them!" the magikarp proclaimed, the golbat sighed and looked over at the group who where talking about leaders. "Let's just work as equals. We'll talk things through before making a final decision." Staccato said. The golbat tilted his head, equals? In a group like this? Maybe, but the golbat himself couldn't remember a time when there hadn't been some sort of leader in a group. Back at his flock his father had been the clan's leader, and his older brother while a jackass had been a good leader for his small group as well. Ven had always been around natrual leaders who came out of the small groups, and maybe one would come out of this one. The golbat looked back at the magikarp still hearing its out gloating. "I told you to zhut up!" He needed to either get this fish away or have it be quite and since it didn't seem willing to do the latter he began to push it towards the water. "So may I ask who is in charge of your little group?" Mist tilted her head. Leader? She didn't know who was the leader. It was definitely not her, she was too cowardly. Too nervous. "How about Stacatto? He's the one that suggested the idea in the first place~" The Vupix spoke up. She blinked, before nodding. "Y-Yeah, I-I think St-Stacatto is a g-good le-leader." she smiled. The Chatot replied. "Oh no, no, no! Really, I barely got out of the fight we had in that lighthouse, I don't think I'd be the real leader of our team, in any case." Mist blinked, then smiled a bit more, staying silent. The Magikarp was yelling curses now. She hissed in annoyance. What a burden. She felt the Golbat on her head snap at the stupid infected. "Zhut up! Other eenfected can 'ere you!" She gave a silent agreement. She didn't want to be battling more living dead. Stacatto spoke again. "Let's just work as equals. We'll talk things through before making a final decision." Equals. A concept she had never learned. She was always ridiculed in society and was constantly a superior in her team. 'Equals.' she thought. 'It would be a nice change'. The Magikarp kept on annoying them, gloating about it's strength. "I told you to zhut up!" Suddenly, she felt numb. Rage was boiling inside her so hot that her body felt lifeless. She blinked in confusion, before scowling at the Fish. "You know what..." she hissed. "I'm pretty sick of you now." And without another word, she slammed her Dragon Tail against him, sending him hurling to the cold, stone walls. She quickly used Fire Fang, heating him before she swallowed the fish whole. It tasted like normal fish, if not a bit rotten. Mist hadn't eaten a decent meal in months, and she was grateful for the food. She blinked calmly, digesting her kill. "Let's go." Seion paid no mind to the death of the Magikarp, seeing as it was only dead weight to the group anyway. Everyone seemed to say that the Chatot was the one in charge, and he couldn't really complain, he seemed more like the leader type then the rest of them did. He followed once again behind the Chatot, and now even the Arbok as he slithered on. 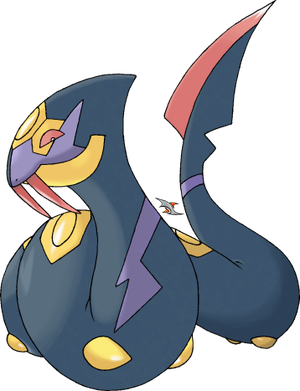 The Sevipers bladed tail hitting the ground every few moments as he sharpened it to be ready for what they would face at the Johto Battle Frontier. Staccato watched in wicked fascination as Mist easily darted towards the Magikarp, killing the poor thing as if he were a twig. The Chatot tweeted nervously as he saw the blood trickle out of the water type's open mouth. Remind me not to cross the line with Mist! He warned himself mentally. He'd rather not fight with any of his teammates anyhow. They had enough to worry about without more being added to their plate because of feuds between themselves. "Let's go." The Arbok said in an unnerving calmness, though Staccato shook off his weariness. Probably just lack of sleep. Staccato glided and propped himself upon the cafe's sign, holding a low note to catch his friends' attentions. "Let's rest in here for a while. Frankly, we can all use some sleep." The Chatot gave off a yawn, chuckling as he recovered. "Some more than others, I guess!" He wanted a life with these Pokemon. Not a life filled with incessant running and fear, but a life of leisure and laughter. I'd fight to see even one day where that happened. Ven didn't like the sight of the dead fish, no matter the different shade of red it was he resigned to staying on Mist's head and watched as Staccato lead them to some 'cafe' something for humans, which Ven knew a bit about from his mother and the various trainers that had come in to his caves. Of course humans, even dead humans where a new sight to him so he watched it all with intrested eyes. "Let's rest in here for a while. Frankly, we can all use some sleep." As if on cue Ven yawned and nodded. He liked the thought of sleep, it had been a big tiring day. The group arrived at the cafe within Olivine, where Stacatto began to speak. "Let's rest in here for a while. Frankly, we can all use some sleep." The parrot yawned and chuckled. "Some more than others, I guess!" Mist laughed too, smiling. "Y-Yeah." Ven yawned too, the Golbat nodding on top of her head. Mist swiftly headed over to the counter, where a specific man used to sit and eat. The man had given her trainer the HM Strength and also her favourite type of berry, Oran Berries. She looked over the counter, searching. 'Maybe the sailor got the berries here? I hope so...' she thought as she pushed her body to the other side of the counter. The bloodied tail of Mist flicked through the shelved items on the wall, meticulously sorting through the stacks of drinks and food for the berries that she dearly loved. After a few minutes, she hunger her body with a defeated sigh. "Th-They're not here..." she murmured, slithering back to where the others were. "I gu-guess I'll g-go to sleep."